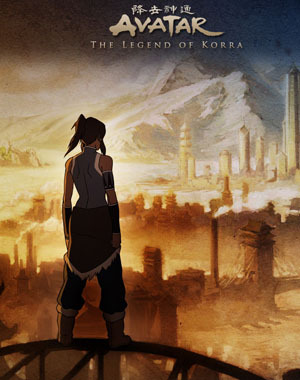 By now, I have watched five episodes of The Legend of Korra. Since I like to do some fiction-related blogs every once in a while, a review is in order. 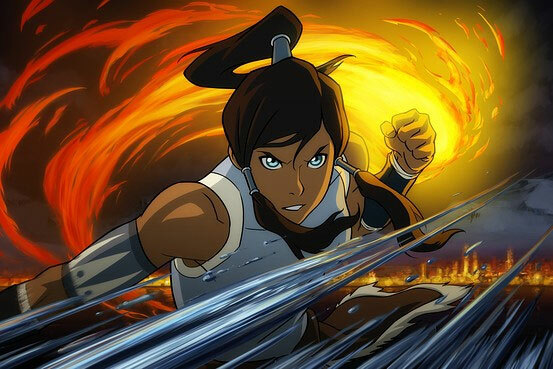 Korra is an animation series that I was not too anxious to watch because Avatar: The Last Airbender ranks on top of my TV-list. Avatar was amazing in its multicultural atmosphere, its diverse and interesting cast, its fleshed out universe and details (e.g., the choreography of bending) and its sincere, tragic and inspiring plot lines. It stood out as a Western animation that was clearly inspired by anime and its sequential, comical but also tragic storytelling. 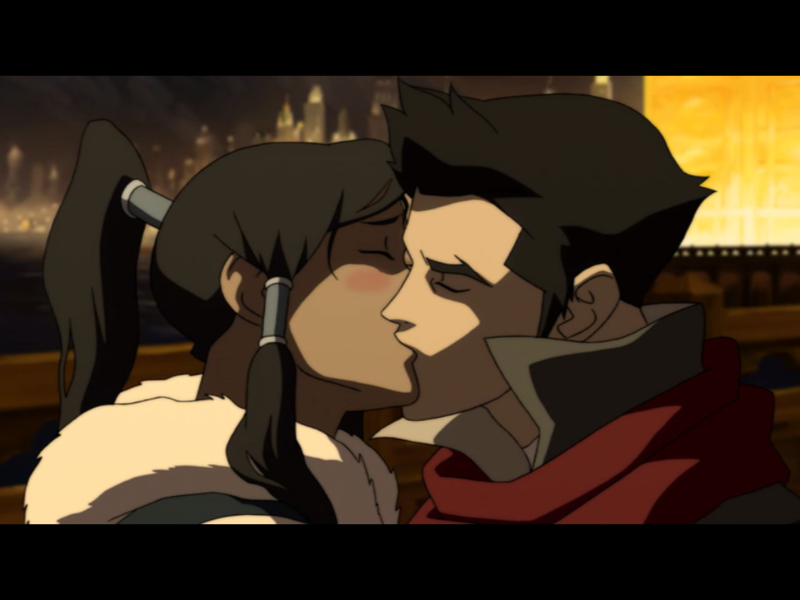 Korra, then, was something that I could not really feel excited about. The main character seemed so cool and the premis so amazing that I felt it would disappoint. It didn’t. In fact, it adresses its fan base even more than the first series did and plays with the huge legacy of the series very well. With the exception of episode five, I am quite amazed. Let me tell you why. a) The main cast is simply amazing. Both in terms of personalities and ethnic diversity, but also in terms of age. Even compared to anime – where there may be older characters but those will be in their twenties or thirties, maybe added up to by an excuse old man – this ensemble stands out. Some of the more important characters that actually carry the plot until now are the children of previous cast. 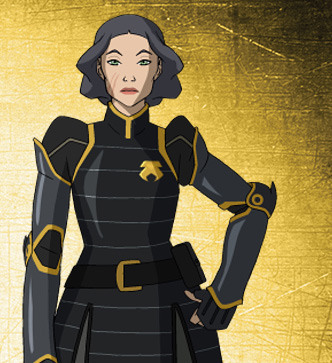 Those that seem to have the most background are Tenzin, his wife and Lin and we’ll probably be seeing more older characters pop up that have some relation the previous show. I like it how this also involves the older viewers more and also establishes good storytelling. Where I was sceptically about setting a show so late after the first series, it actually works out very well and still has clear relations to the older series. b) What a rich universe! Seriously, we are dealing with industralisation here but not in a steampunk way, rather they carried it further to metropolitan city that’s young, has an American feel to it and is structured like Hong Kong mixed with the roaring twenties. I am excited about this. The addition of technology really gives the universe shape and will probably in due time also play a vital role in its politics and the way that bending is given shape. Bending is also dealt with less in relation to spiritual and martial arts and more in relation to sports. This becomes very clear in pro-bending, which seems to be a combination of wrestling and martial arts with more emphasis on area control, is a very interesting one, though its rules are still somewhat vague. c) There’s new political intrigue. This time, the concept is not nation vs. nation but benders against normals. It reminds me of Harry Potter, RPG’s like FInal Fantasy IV and series (e.g., Merlin) in which magic gets banned. 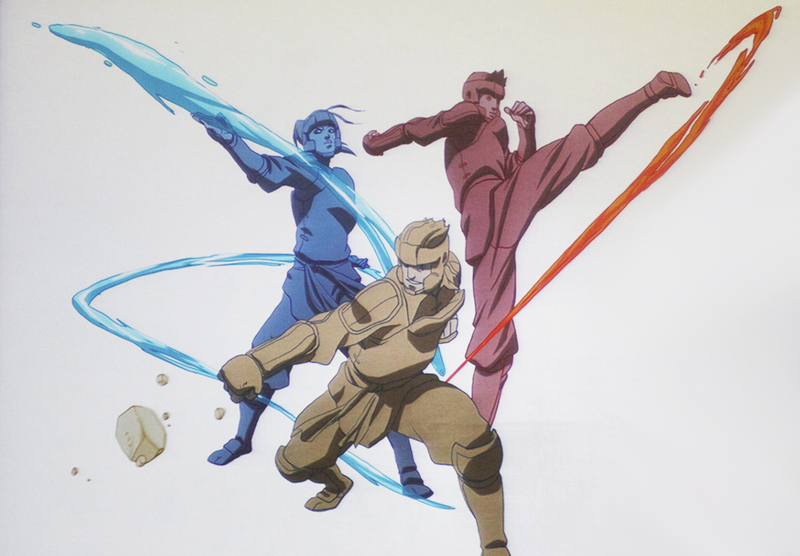 The new antagonist is not just someone who fights benders with technology, as one would expect, but one who actually removes benders’ chi in some way. Though I expect his power to be technological, because it would fit the themes of magic vs. technology in the show more, I also get the impression there are hints towards this (e.g., his henchmen have weapons that resemble bending). 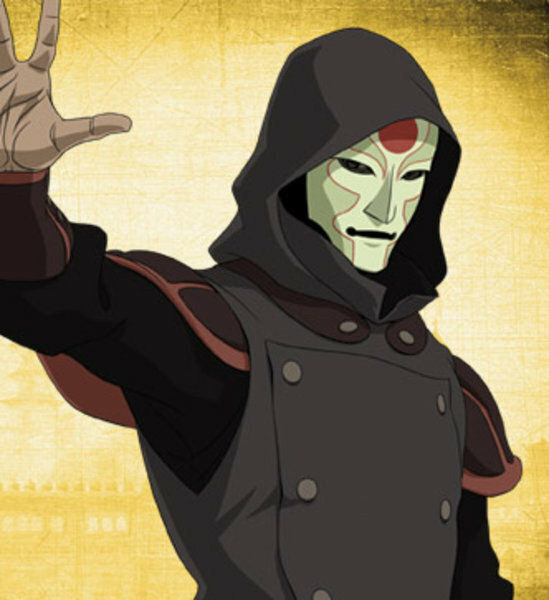 Nonetheless, this villain portrays himself as an ideological one that has certain strenghts and, awkwardly, is no different from the benders. It could also be that he is someone that is actually a bender but managed to use his power in a very negative, dark sense. This would also be a very promising way to go. d) The show really adresses its fan base. In the previous series, the writers already played with this and for instance wrote an ep about a theatre play in which the entire show is reproduced from the fans point of view (including popular romantic pairings and jokes). Now, jokes as ‘whatever happened to Zuko’s mom?’ are asked by the grandchildren of Aang. There’s a lot of nods towards the audience but also much more teasing. Because there’s a gap of seventy years between the series a lot of events are left unrecounted and especially what happened to Aang and Zuko is a mystery. On purpose, obviously, and that makes the show spicy. A lot of the viewer’s experience depends on the previous show, expectations of it, and speculation. We want to assemble the plot and theorize about what happened and sometimes, we see Korra retrieving a few memories, but because she isn’t very spiritual, it will probably take her a long time to get into Avatar mode and have a real conversation with Aang. Personally, I see problems with all of this because the show taps into the previous one and a more mature, reflexive audience so much that it may be difficult to draw new and younger viewers. This may not be problematic per se, because the show does not disappoint the fans and caters to them well, but it may not be the right angle for a commercial show. It’s a fine line to walk, that between adressing and a big audience and rewarding your invested audience, that you want to engage more by intertextual, nudges and by elaborating your story world in a very refined, multimedial way. I think the romantic The Spirit of Competition (episode 5), in which the characters of Korra were already paired up in various ways and in which writers already seemed to pre-create a kind of ‘shipping’ fan base was not a very correct move. We do not know these characters well yet and especially Mako and Bolin are still somewhat flat and only developped as partners of the female characters. They have been through a lot but we don’t know what yet and here they are already dating away. Where does that leave the rest of the episodes and building up towards love conflicts? The slow love and the confusion that shippers tend to invest in. In this episode I see very clearly that writers still experience troubles when adressing the fan base and sometimes, try to do this so clearly, that fans are not interested anymore. Another show that has these tendencies at the moment is Glee, which taps into its fan base so much and tries to create so many ‘wants’ that it leaves its fans feeling empty or betrayed quite often. Part of being a fan means investing in alternative story lines or pairings that the writers may not have written, but if shows suddenly start writing it all, being a shipper becomes less fun. Personally, as someone that loves swooning over media pairings, I recognize some of the anger that I see when I browse through responses over Korra episode 5. Overall though, I think this show will try to do good and seems to have a story line worth watching. Let’s hope they play it out well!